Should your next laptop be Windows or Android? 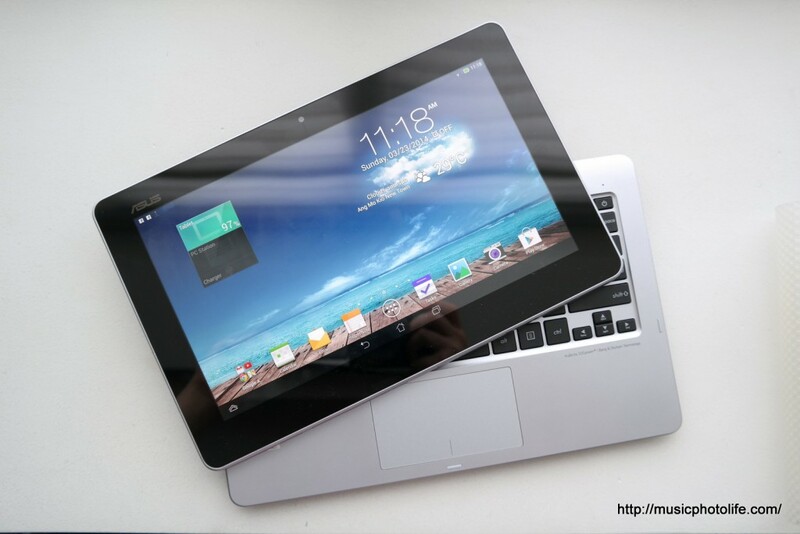 ASUS Transformer Book Trio has both! After hearing so much about this techno-marvel, I finally received a review unit from ASUS Singapore to find out how well it works in real life. 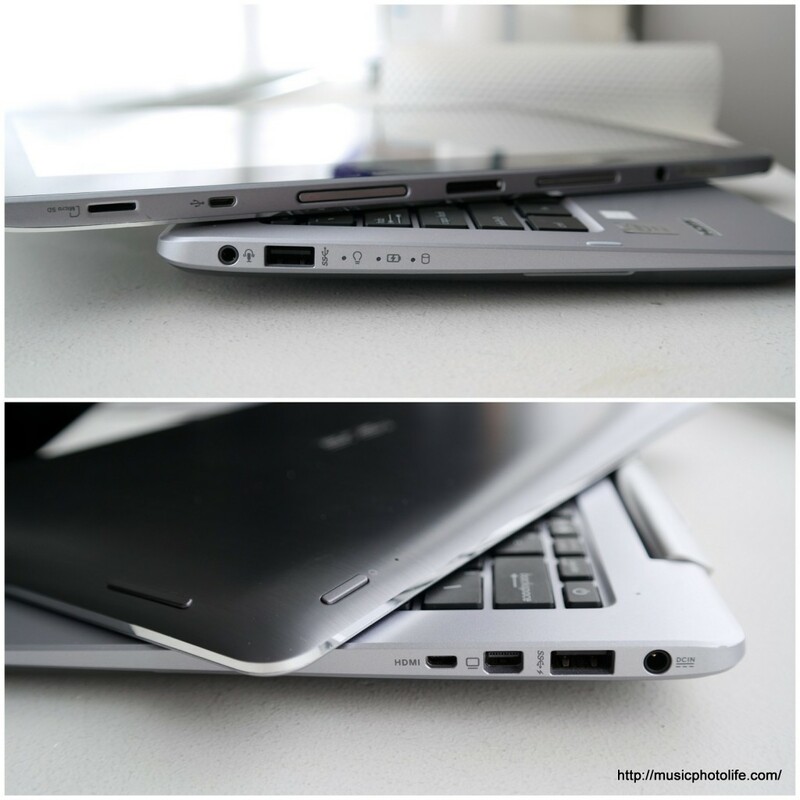 The Transformer Book Trio is literally 2 devices fused into one. There are 2 sets of dedicated hardware to power up the Windows mode and Android mode, including the processors, Wi-Fi chips, power buttons, data storage, 3.5mm headphone in/mic out jacks, speakers, batteries, USB ports. It even comes with 2 separate chargers, and though you can charge both batteries via the keyboard charging port, do keep watch the respective charge indicators to make sure both batteries are fully charged. The only things they share are the display, the keyboard, and the left ports on the keyboard (phone jack and USB port). Here’s how the Transformer Book Trio works: both Windows and Android modes are run independently using their dedicated processors and hardware. You can choose to turn on one mode while leaving the other mode powered down. Each mode is aware of the other mode’s wake status. Assuming both modes are powered up, pressing a keyboard button allows you to toggle between 2 modes instantly. When you undock the tablet from the keyboard, the tablet screen changes to the tablet mode, while the Windows mode remains active. When you dock back the tablet, you can switch back the screen to Windows mode and continue where you left off. 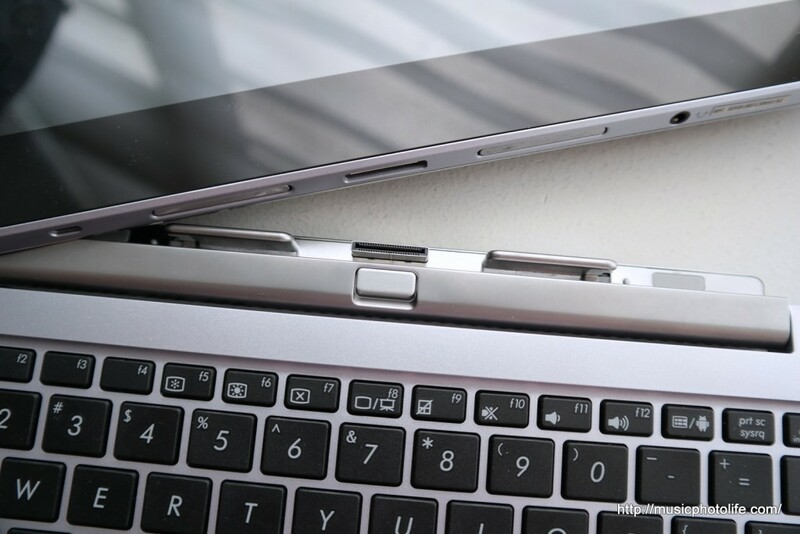 And unlike the Android-only ASUS Transformer devices, the keyboard portion which houses the Windows hardware remains powered up and running even though you undock the tablet. This is essentially the third mode: the ability for the keyboard portion to continue operating in Windows when plugged into an external display via the HDMI or the DisplayPort. In a typical user scenario, when you are home, you can use the Transformer Book Trio as a Windows desktop (with external display monitor) and Android tablet simultaneously. When you are on the go, you can use the Transformer Book Trio as a laptop, toggling between Windows and Android modes back and forth. Switching between Android and Windows is fuss free, provided the system resources are not busy. The Transformer Book Trio is 11.6-inch, with a larger matching keyboard dock than the usual Android Transformer size, and so provides a more comfortable keyboard experience. The magnetic dock is easier to handle and has a more seamless rear panel, compared to the Android Transformer docks. The product comes with 2 chargers so that both units can be charged concurrently. Battery is able to last about 13 hours if only Android mode is running. When both modes are running, Android mode can last 8 hours while Windows mode can last 5 hours. Switching from Windows to Android could be slow if the system is busy. The Windows mode performs sluggishly despite running i7-4500U, most likely due to the relatively slow HDD instead of SSD. Sharing of files between the 2 modes is not that convenient. It relies on existing Windows file sharing protocol. For instance, in Android mode, to access Windows mode folders, you need to enable the folders to share in your home network which requires login and password to gain access. In Windows mode, accessing your Android folders is via the media transfer protocol (MTP). If you want to share files when the tablet is undocked, both devices must use Wi-Fi hotspot mode which means the devices cannot be connected to your home network to access Internet. The power key on the keyboard is easily mistakenly pressed, sending the Windows to sleep mode. ASUS should put the power button elsewhere instead of part of the keyboard. I don’t quite like the positioning of the rear camera. 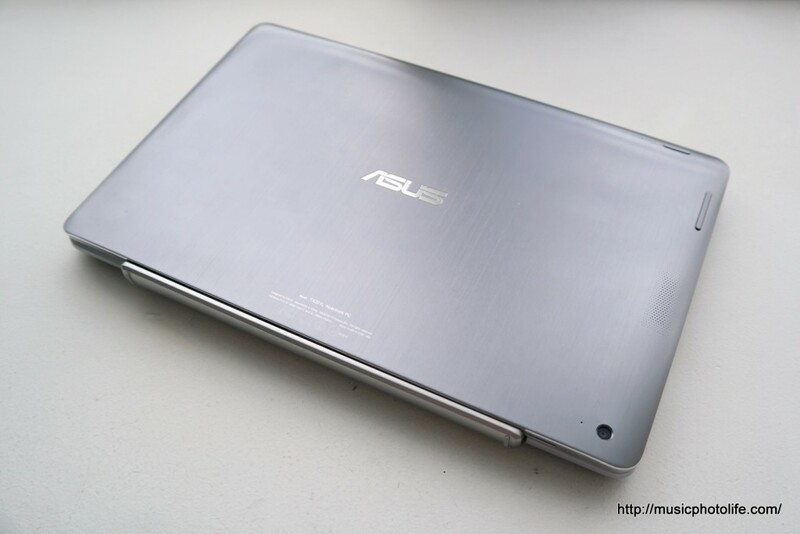 Asus assumes that consumers will only use the rear camera in tablet portrait mode. Imagine when shooting in landscape mode, you have to tell people to look at the camera below your left hand. The way I see it, the Transformer Book Trio caters to the group of consumers who understands the immense benefits of laptop-like Android experience but also need a Windows laptop to do things that current Android can’t. This group of consumers would always use their tablets with a Bluetooth keyboard, with a total package weight of about 1kg and a cost of around S$800 (including a pretty book case stand and keyboard). They would also be lugging another separate Windows ultrabook of 1.5kg probably costing another S$1300. The price of this combo comes to over S$2100 and 2.5kg. Comparatively, Transformer Book Trio weighs 1.7kg and costs S$1998. You can practically use both Android and Windows from a single keyboard and display, so there is no need to set up multiple keyboards and displays on your workspace just to get things done. Plus, it is possible to use both devices at the same time when you connect the keyboard dock to an external monitor. Visit the microsite for more product information.